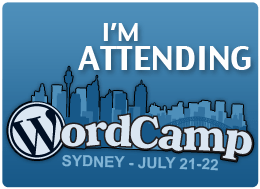 If you’re in Australia (or Australasia) and work with WordPress, you should get along to WordCamp Sydney 2012. Australia had 2 WordCamps last year – Melbourne & Gold Coast. Both of which were fantastic events full of fun and learning for all who attended. This year, Sydney is set to be flying solo, so it’s you’re only chance for 2012. Tacking a post_type parameter to any search URL in WordPress filters the search results by a post type. Will return only events which include the terms speak and easy. But when setting the post_type parameter to page, something unusual happens. When you request only search results that are pages, you’ll get results of all post types. This comes about due to the publicly_queryable value for pages being set to false and a bug in core (Trac ticket). * so that search results can be filtered by page. Changing a setting directly on the global is not ideal, but I couldn’t find an API function for changing the publicly_queryable or any other post type setting. Did I miss it? When publishing a post on WordPress.com these days, authors receive a new sidebar alongside their post. The most interesting feature in this sidebar is a game-like progress bar. Arbitrary goals are now being set on WordPress.com to encourage blogging. Publish a post, level up. WordPress.com just got gamified (I hope players don’t lose points for using a made up word). It’s gratuitous, unnecessary and fun. And the carefully curated quotes below the progress bar bring the pursuit of post count irrationally close to a noble quest. I think it’s good use of gamification. WordPress.com need all the content they can get to boost page views. That said, I’m quite surprised to see this feature added in light of Automattic’s strategy to simplify the blogging experience on WordPress. Here’s to experimentation though and I hope it works. The Greeks used fire beacons at the time of the Trojan War, in the twelfth century BC. A bonfire on a mountaintop could be seen from watchtowers twenty miles distant, or in special cases even farther. The meaning of the message had, of course, to be prearranged, effectively condensed into a single bit. A binary choice, something or nothing: the fire signal meant something, which, just this once, meant “Troy has fallen.” To transmit this one bit required immense planning, labor watchfulness, and firewood. How far we’ve come in transporting information. — Fast Company | Why Y Combinator Replaces The Traditional Corporation. Paul Graham on the need for incubators.